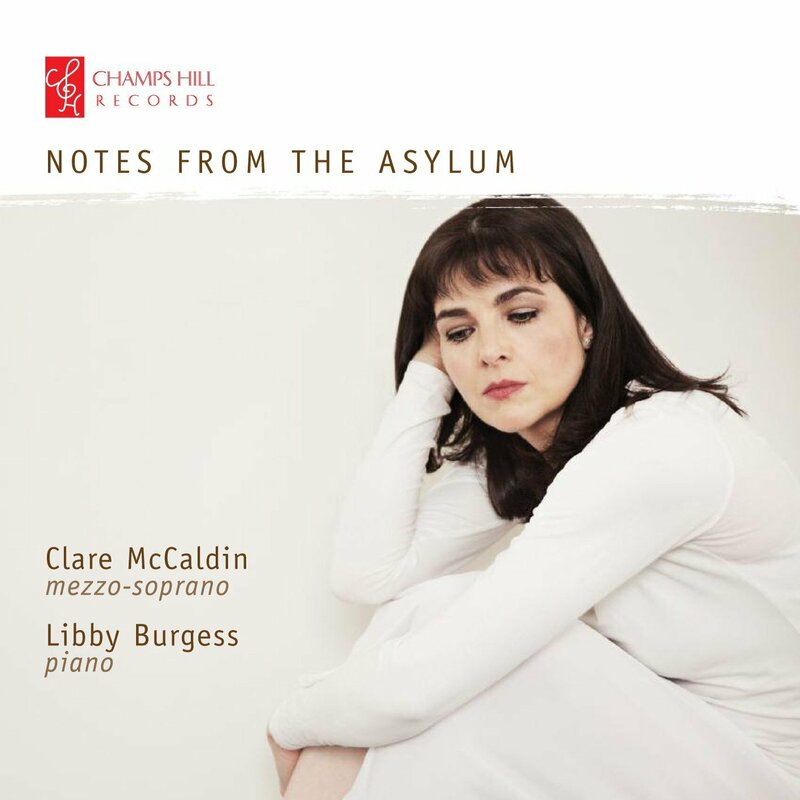 I heard Clare McCaldin and Libby Burgess perform Stephen McNeff's Vivienne at The Forge, Camden and am delighted to find that they have recorded it. As the opera examines the marriage of Tom and Vivienne Eliot from Vivienne's point of view whilst in the asylum where she died, McCaldin and Burgess have chosen to pair the McNeff with music from earlier periods which takes madness as its starting point with Benjamin Britten's realisation of Henry Purcell's Mad Bess, Harriet Abrams' Crazy Jane, Johannes Brahms' Ophelia Lieder, Hugo Wolf's Eduard Moricke settings sung by the character of Agnes from Morike's novel Maler Nolten, and Ned Rorem's song cycle Ariel setting poems by Sylvia Plath, where the performers are joined by clarinettist Catriona Scott. The mad song became a standard Restoration genre, and Henry Purcell's Bess of Bedlam seems to have been one of the first. It is probably not a theatrical piece, but is dramatically vivid nonetheless and is here given in one of Britten's realisations written for Joan Cross in 1945. I have to admit that I find Britten's Purcell realisations something of an acquired taste, and give the piece a rather 20th century tone. Here Clare McCaldin sings vividly, and captures the varied tone of the piece, though I wish that the recording had picked up more of her words. Harriet Abrams was a singer in 18th century London, including singing with Haydn at the keyboard. She wrote songs too, and Crazy Jane sets Monk Lewis's words. It is conventionally strophic with a polite 18th century feel, but McCaldin points the words and brings out a sense of character. Brahms' Ophelia Lieder were written in 1873 for a production of Hamlet in Prague, and almost certainly did not use a piano for that first performance. There is something quite folk-ish about the songs, and the German translations of Shakespeare really come over. Auf morgen is Sankt Valentins Tag is charming, whilst Sie trugen ihn auf der Bahre bloss has a moving simplicity to it as well as a nice irregularity, whilst the final song Und kommt er nicht mehr zurück is really pared down. The Ophelia-like character of Agnes is from Eduard Möricke's Maler Nolten and here Clare McCaldin sings a group of Hugo Wolf's settings. Agnes is spare and rather folk-like but in this highly expressive performance it is also a touch unnerving. The dramatic Lied vom Winde has some brilliant wind effects in the piano, with the fragmentary vocal part rather more words then melody. Seufzer combines some austere harmonic adventures in the piano with bleak melancholy in the voice, this is Wagner's harmony without the lushness. Wo findet ich Trost has more chromatic Wagner-inspired harmony to create a vivid and expressively dramatic song. The final one of the group, Gebet has a slow, hesitating piano part creating a highly austere song. Ned Rorem's Ariel, Five Poems of Sylvia Plath were written in 1971 as a gift for the soprano Phyllis Curtin who performed it in November that year (Curtin died earlier this month at the age of 94, see her obituary in the New York Times). The poems set are amongst the last of Plath's writings. Words is highly edgy with a sense of fragments from the voice, piano and clarinet gradually coalescing, highlighting the contrast between the performers. Poppies in July has a bleak, long slow undulating vocal line with the clarinet weaving around the voice. As the song develops it gets quite intense. The Hanging Man has a very expressive vocal line, with the clarinet and piano commenting. Poppies in October has a more delicate texture with a more lyrical sense, but also a feeling of a threnody. The final song Lady Lazarus is the longest, and most highly dramatic with both voice and clarinet to the fore. The fact that, for copyright reasons, the words are not printed in the booklet is the biggest loss in this song. The cycle is very atmospheric for the way it captures the combination of the manic and the bleak in the poems. Stephen McNeff's Vivienne with words by Andy Rashleigh was written for Clare McCaldin (their previous collaborations have included McNeff's Madrigali dell'Estate, see my review). It pictures Vivienne Eliott in her room in the asylum reminiscing about her life with Tom Eliott and imagining him coming to visit her (he never did). The first song has her remembering life before Tom and McNeff introduces the first of many reminiscences of period music, weaving it in and out of the texture. The vocal line also wanders in and out of melody, as we imagine Vivienne singing to herself and then continuing to reminisce. The second song has Vivienne remembering Eliot's wooing with a delightful honky tonk piano accompaniment. The Land of Lost Content is bleakly melodic, popular song still hang round but the mood is intimate and confessional. Bertie relates Vivienne's affair with Bertram Russell in the style perhaps of music hall song written by Walton, complete some spoken, patter vocals.Through the Darkness I Can Hear is darker and more serious, there is almost not popular music in the background and instead we get a rather intense monologue for Vivienne as she recounts how she wishes to see Tom again. McNeff's writing has a lyrical side to it, but always with a nice edge to it, never comfortable. The final song, the longest, has Vivienne imagining Tom comes back. It starts quite structured but becomes increasingly fragmented and dark. The voice almost alone at the end and it doesn't so much end as evaporate. Vivienne is a remarkable tour-de-force, in the flesh the piece is highly theatrical but this new disc does really capture the brilliance of McNeff and Rashleigh's recapturing of Vivienne Eliott's point of view. The whole recital puts together an interesting sidelong view on madness, combining both fictional characters and real experience.